Busses to Kandy run 24 hours per day from the Central Bus Stand in Colombo Fort area, leaving every 15 minutes between 4am and midnight, with a slightly reduced service through the night. What is the ticket price from colombo to kandy? 1)Does Bus number 1 to Kandy stop at Katunayake airport bus station(Averiyawatte,, Katunayake, Sri Lanka) or near airport? 2) Does Bus number 48 stop at Katunayake airport bus station(Averiyawatte,, Katunayake, Sri Lanka) or near airport? No – I don’t think No 1 goes near to the airport, nor does number 48 by the looks of it. Can someone please tell me how to book the tickets online? Or do you just show up and see how it goes? Hi, You can book tickets for some routes at busbooking.lk and also through the local mobile phone companies. Or you can simply turn up and get a ticket on the bus. How long is the bussride from Colombo to Kandy? It is about 3-4 hours approximately. me and my girlfriend would like to go by bus (Route No1 ) to a Pinnawala Elephant Orphanage. Could you please tell us, at which station we would have to jump off? How many hours would the ride take? Aftrerwards we would like to head on to Kandy (I guess also via Route No1). 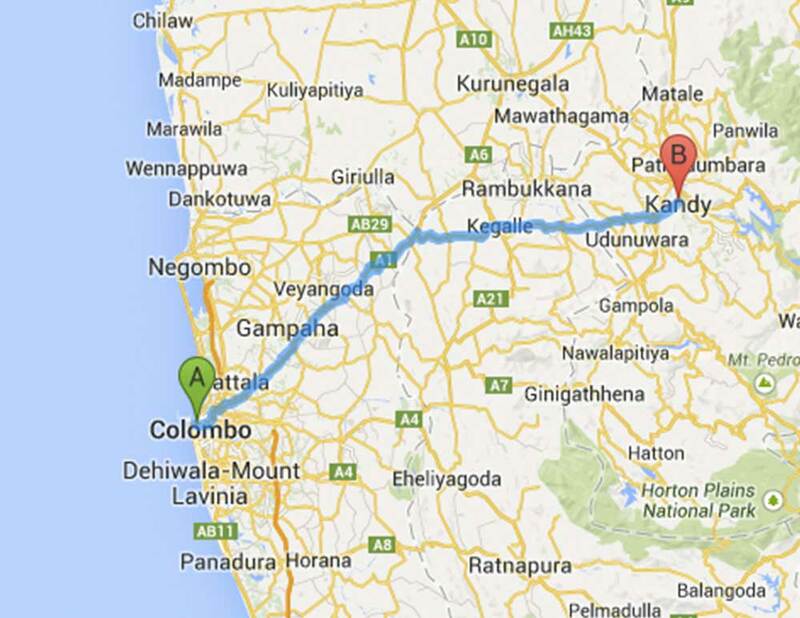 Could you tell us, how long it will take the to Kandy?